Spring is a great time to assess any damage to your home’s drainage system. With spring around the corner, it is definitely the time of year to consider using the spring cleaning mindset to address any issues in your home’s plumbing and drainage system. If you’ve been noticing any of the telltale signs described here, now may be the best time to consider weighing your maintenance service options. Are There Stains In and Around Your Basement? Perhaps the most noticeable signs that your home may be in need of serious drainage system maintenance is if you’ve been finding water stains around your home’s lowest level. Traditionally, the basement is where most common drainage problems will manifest first. Unfortunately, it can also be the area of the house where, unresolved, the cause of the stains can do the most damage. Stains along the wall of your home’s foundation can usually lead to an explanation as simple as an overflowing gutter or surface runoff — and, luckily, this is an issue that can be easily fixed. However, if the noticeable stain appears to extend throughout your basement, you may be suffering from a fluctuating water table or that, perhaps, your basement floor is below the level of the existing storm drains. If this is the issue, an interior drain pump coupled with a good sump pump can combine to form a workable drainage system. 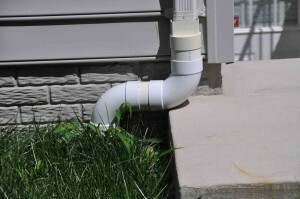 Is Your Home Experiencing Gutter Runoff? While basement flooding and staining will always be the most noticeable sign that your drainage system is in need of repairs, if you haven’t had that issue (or, if your home doesn’t have a basement), the most likely problem you may be noticing are flooded gutters. Mud spattered on the gutter siding and paint peeling off the house are visible signs that your gutters need to be cleaned or replaced. Over time, flooded gutters left unattended can cause eventually cause structural damage to your home’s exterior. It’s always easier to fix a minor problem before it gets out-of-hand, or more expensive — and being sure that your gutters are cleaned is the easily the cheapest alternative to having to replace them around your home’s total front and back yards. For more information about drainage solutions for your Maryland home, call Aqua-Bright today at 410-489-9009 or take a tour of our website. We offer top notch irrigation services from seasoned professionals. You can follow Aqua-Bright Irrigation & Illumination on Facebook, Twitter, Google+, and LinkedIn for more updates and information about our illumination and irrigation services! For examples of our work, check us out on Pinterest, too! This entry was posted on Monday, March 20th, 2017	at 4:04 pm	. You can follow any responses to this entry through the RSS 2.0	feed. Both comments and pings are currently closed.